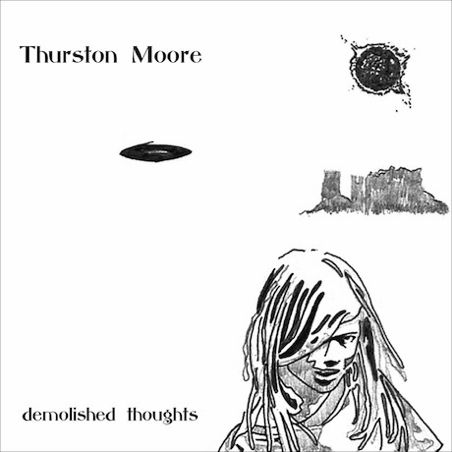 Whisper "I love you, my darling"
Thurston Moore's 2011 solo album, Demolished Thoughts, was produced by Beck. It was recorded in Beck's home studio, which is called The Library. "Benediction" is the first track on the album. On day one I played the first song sitting in front of a Beck-wired microphone, its design informed by the cut of Joseph Beuys' cerebellum. The jam is called 'Benediction', where the camera records the adult girl reading a love letter written on the back blank pages of her hymnal where he knew only she could find it. "Benediction" has a nice warmth to it, with lots of Thurston's acoustic guitar mixing with swells of violin all over the song. Beck's rhythm section at the time, Joey and Bram, play a subtle bass and drums beat underneath. I may be biased, being a Beck website and all, but the production is quite amazing, leading to a very simple and straightforward, yet striking track.